17th Century Spanish Cup Hilt Rapier "MI SINNAL SANTISMO CRUCIFICIO"
In good condition, a good late 17th Century Spanish cup hilt rapier marked on the blade "MI SINNAL SANTISMO CRUCIFICIO" (My sign is the Holy Cross). "MI SINNAL SANTISMO CRUCIFICIO" is accredited to mean the blade and sword were made by Enriques Coll AKA Eiriko Gol, a Spanish swordsmith working in Solingen (Prussia, Germany) towards the end of the 17th Century. The inscription is very weak one side and almost nonexistent the other, but together it is possible to determine that this is the inscription on the blade. The 31 1/4 inch blade is in overall good condition; the tip area with some former rust pitting, but sound enough. The blade generally straight as they come but with a very slight curvature towards the tip area. 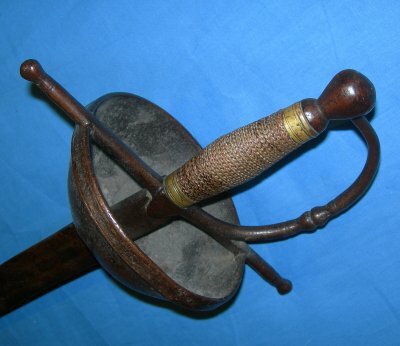 The hilt in very good shape, the twisted wire grip also exceptionally good. 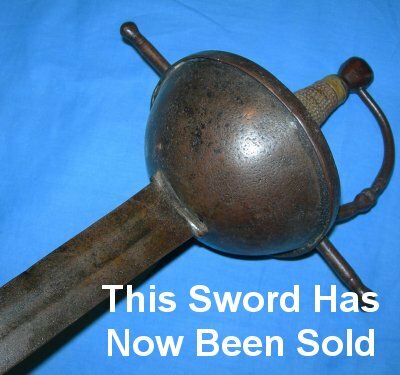 In all, an above average example of a very fine and robust fighting sword. Plenty of lesser examples available elsewhere for around the 2000 GBP mark, so our price is exceptionally good, a true investment as it will appreciate in value from the moment you order it! Further / large images available upon request. Please quote item reference number C74 (656).